Our living room is one of the busiest parts of our home. It is an area used for entertaining, watching our favorite movies, and chatting about the day’s events. This room typically has the most seating, from sofas, to armchairs, to ottomans. We like our living room to be welcoming, warm, and most importantly, comfortable. One of the biggest design dilemmas that we face when choosing how to decorate our living room is figuring out a plan. It is difficult to decide on paint color, furniture, and accessories, while maintaining function and aesthetics. We thought it would be helpful to give you some tips on how to make these choices, and show you some of our living room inspirations, as well. 1. Size of your room. If you are trying to make your room appear larger, stick to lighter, brighter colors. If you are trying to make a large room feel more cozy, darker colors are the answer. 2. Natural light. 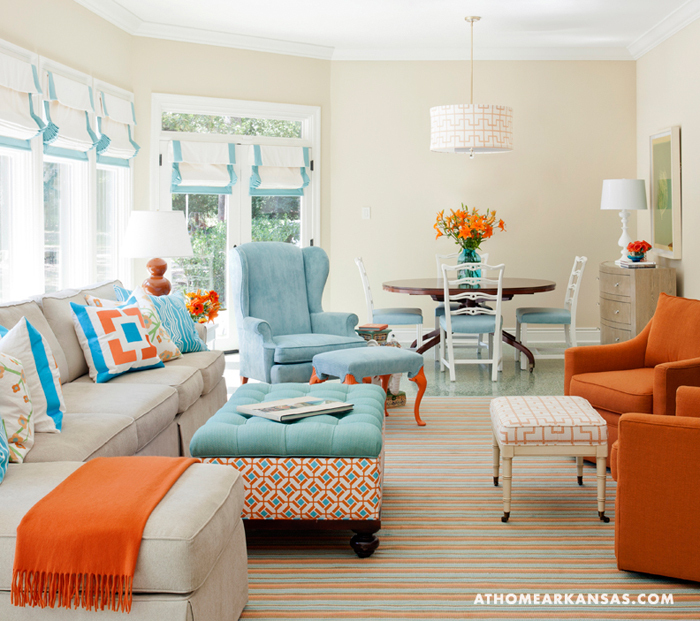 If your living area is in direct sunlight, you are best off painting it with more saturated colors. The natural brightness of the sun can have a dulling affect on paint visually; bold colors can withstand this, and make their statement. However, a simple, clean white paint can really emphasize the sunniness of the room, if that is what you are going for. If your living room area is away from natural light, you will want to stick with neutral, light colors. This will make the room feel brighter. Dark colors typically are placed as accent walls, or in rooms where a cozy feel is desired. 3. Warm vs. Cool tones. Do you like your living room to feel warm and cozy? Or, perhaps you like a clean, fresh feeling living room. This is where color choice can play a large role, as well. Warm toned colors, such as red and orange will give your room a well, warm feeling. Cool tones, such as blues and greens, tend to give your room a fresh, cool feeling. 1. Size of the Room. 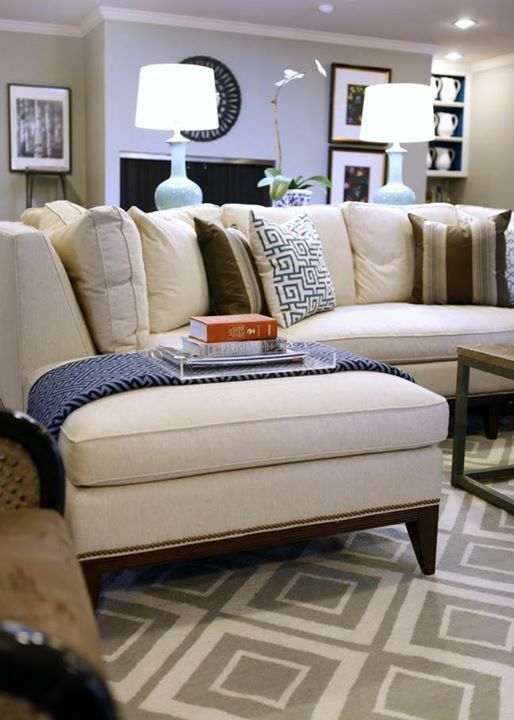 How large or small your living room is, can play a large role in choosing your furnishings. It is important to consider scale. If you are furnishing a room with 20′ ceilings and an open floor plan, you may want to consider larger scale furnishings to fill the space, while emphasizing the grandiosity of the architecture. If your living room area is smaller, closed off (more traditional layout), you will want to choose furnishings that fit the space, while maintaining flow. 2. Function of Your Room. Do you like to entertain? Do you have family movie night in your living room? How many household members are there? Do you have small children who keep their toys in this room? It is the function of your living room space that is an important factor to consider when choosing furniture. A large comfy sofa with a chaise would work for a family with children. A modern, sleek sofa would be ideal for a single professional. 3. Storage. Do you need storage? It is important to consider storage when purchasing living room furniture as well. Would a coffee table that doubles as a storage trunk be ideal for your space, or a simple, lightweight ottoman instead? Once you have figured out the paint and furnishings, it is time to consider the best part: the decor. People are always amazed at the impact the little things can make on a room. From throw pillows to accessories, it is the decor that can pull all of the other factors together. 1. Color Palette. A very common misconception people have when decorating their homes, is that everything must match perfectly. Actually, there is some truth in this; but not fully. 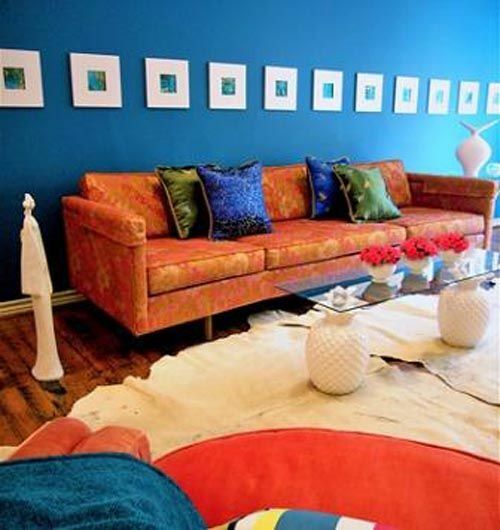 It is often key to integrate the colors of your paint and furnishings into your throw pillows and rugs. But, did you know that you can integrate those colors in different saturation, lightness and darkness, even hue, and still have it look gorgeous? Complementary colors (colors opposite from each other on the color wheel) work best when choosing a color palette. 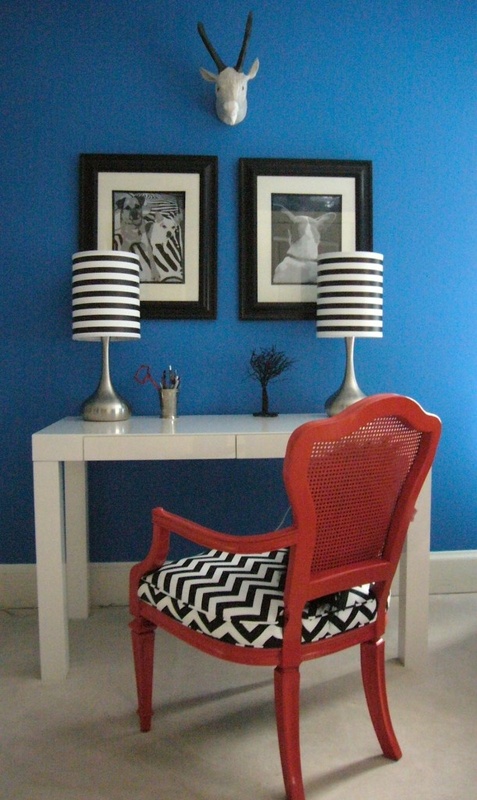 If your walls have a blue tint for example, some orange-toned items in your room would flow nicely. 2. Pattern. It used to be trendy to match your sofa to your drapes, to your pillows, and so on. This is no longer the case (thank goodness)! Having a mixture of pattern in your space can allow for many secondary focal points, and bring harmony to the design. When choosing patterns, it is important to consider where you are placing it. If you have a large scale, repeating pattern, it may look to busy on your sofa, leaving the mind restless. Large scale, and brighter colored patterns work best as throw pillows and rugs (unless you are trying to make that piece of furniture your focal point). Small scale repeating patterns work well on furniture and window treatments.